Safe Oil for Before and After Childbirth! Gentle Baby Essential Oil is a gentle oil blend that was designed for moms, moms to be and even newborns! It has ten therapeutic grade essential oils that are safe to use during pregnancy and on your baby. From stress to stretch this oil can help to address before and after pregnancy challenges. Place it on Dad during delivery to help keep him calm as well! It helps calm emotions during pregnancy and is useful for quieting troubled little ones. Gentle Baby is also soothing to sensitive skin. Many of the essential oils in this blend are used in elite cosmetics to enhance a youthful appearance. How ever you choose to use Gentle Baby Essential Oil, you will love it! The aroma is wonderful and you can wear it as a perfume or cologne. Or add it to your bath water for a wonderful relaxing bath. This is an easy reference guide for Gentle Baby Essential Oil Blend. It will tell you how to use your oil blend and what to use it for. It will also provide you with some fun tips and testimonials! Want to Purchase Therapeutic Gentle Baby Essential Oil? Go to the Oil Shop! Buy Gentle Baby Oil Here! What is in Gentle Baby Essential Oil? Please Note that Gentle Baby oil was revised in summer of 2012 because of the deforestation and limited availability of Rosewood Essential Oil. See below for revised formula. 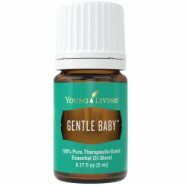 There are ten therapeutic grade essential oils in Gentle Baby! They are listed below along with a brief description of each oil. Rosewood Essential Oil (Aniba rosaeodora) supports healthy skin; it is emotionally stabilizing and is used for relaxation. Rose Otto Essential Oil (Rosa damascena) has an intoxicating aroma that eases stress! It supports healthy skin. It's sweet fragrance that is intoxicating and highly romantic. Very high vibrational oil. Jasmine Essential Oil (Jasminum officinale) as a wonderful aroma that relieves stress and uplifts the mind and body! It is also beneficial for the skin and supportive of women's challenges*. It has been used throughout history for romance and attraction and for balancing the feminine energy of the body. Palmarosa Essential Oil (Cymbopogon martinii) as a wonderful aroma that relieves stress and uplifts the mind and body! It is also beneficial for the skin and supportive of women's challenges. It has been used throughout history for romance and attraction and for balancing the feminine energy of the body. What Healthy Body Systems are Supported*? Nervous Systems; and Skin. What is the Aromatic Affect on the Mind? This beautiful aroma is relaxing and calming. What is the Spiritual Influence? Gentle Baby helps release negative emotions of fear, shock, anger and grief. It also can help with mental exhaustion resulting from over working and not balancing work and play. It will help us choose life and joy over fear and anger. And it will help us become whole. What Chakra is Affected? Opens the sacral and heart chakras. How do I Use it on my Baby? Dilute Gentle Baby by at least 50 percent or more. Only if you have very sensitive skin. May be applied to feet or used as a body massage for calming and soothing. Diffuse. Can this oil be used for Animals? Yes, definitely! Use for soothing skin and calming. Animal babies too! What are the Safety Precautions? Dilution not required; suitable for all but the most sensitive skin. Generally safe for children over 2 years of age. Because of the photo-sensitivity of bergamot, which is in this blend, do not apply to skin that will be exposed to direct sunlight within 48 hours.